I have much to be grateful for, as the year turns to 2009. We are on our way to a large gathering of friends, a quality potluck where the food is equal to the excellent company. We may not stay all night, I’m so ready for quiet, but we will touch base with loved ones on this last day of the year. You all who read this blog, are among those I am grateful for. May your 2009 be as good as my 2008 was. I taught a class recently at Rae’s, a bulky cabled scarf class where both students were very new knitters. They were really happy to learn how to cable! Both had very soft yarns, which will be warm wrapped around the neck. The blue yarn is alpaca, the reddish-rust yarn is an Araucania hand dyed fluffy cotton. I’m super happy with how well they learned this project! Congratulations, ladies. Brian and I keep Christmas at a dull roar at our house. With no kids and no relatives in Lansing, we get away with it, and I’m grateful. We do get out to a lot of gatherings, but at home I am really in need of solitude and serenity when I can get it. Christmas is a pajama day if I can work it out! Gifts are not a big deal; after all, we have each other. We met in our late 30’s so we understand how big a gift that really is. Early this year we got a brand new refrigerator and a stove. We also will be going on a vacation in February, so that is sort of our big gift to ourselves this season. I don’t need gifts to be on the “right” day, you know? Other than that, we do small gifts, usually wrapped, and on Christmas morning. This year I didn’t wrap anything… I am making Brian a pair of mittens for bicycle riding (which are not done yet… but we are making them up as we go, so there is much ripping and re-trying). He got me a very special treat. Lingonberry Preserves! If you have not tried them, they are a lot like cranberries but much smaller (maybe currant sized). They grow wild in Sweden. I have a lot of allergies, and many jellies, jams and preserves have citric acid added to them. Most fruit has a lot of citric acid in it already! The citric acid added in production, is often not from a fruit source (and even if it was, I’m very allergic to some fruits), and I don’t tolerate it well. So when I find fruit anything with three ingredients: Fruit, sugar, pectin… well, you can imagine how pleased I am. When it’s lingonberries? Heaven. The thoughtfulness was much appreciated, he looked a few places before he found these. Thanks, Brian! Brian went on a bike ride Sunday, on a chilly and windy day. The weather was not bad enough for him to stay home. He really misses his bicycle when the weather is bad; he has only missed one day commuting to work on the bike since spring. I’m all for it. I want to keep him a long time. Riding the bike is good for his heart and his mood (not that he’s ever really grumpy… that would be my job). So Sunday he went out in spite of the wind, and got to the west side of town (we’re just slightly east). He came home with groceries, and yellow flowers for me. I adore carnations. They are about the only flower I can keep inside and not feel allergic when in the same room. They last at least a week even if you ignore them, and they are not expensive. They come in a zillion colors, to boot. This week a little sunshine indoors is a good thing. We had two days in a row where it looked like twilight even at noon. Well, Sunday I noticed some sun peeking in the window and moved my face to drink in the sunshine. I think I counted 38 seconds before it went away, but I totally appreciated that ray while it lasted! We went from frigid (4F/ -15.5C) last Sunday, to blizzardy snow Friday and several days of snow on top of that. You could not step into the yard without snow coming up past your ankle! In places there were piles of snow as tall as my car, where they had plowed. Then we got a record high temperature Saturday (60F/ 15.5C). It melted like crazy, lots of us had wet basements, and now the snow is mostly melted except in the piles left behind by snowplows and shoveling. This Sunday we had wind warnings with gusts, and it’s cooled off to about freezing again. Crazy! That’s one week of weather in Lansing, Michigan… even more varied than usual. Here you see a photo of the view from my front porch Sunday. Notice that the street signs are fully colorful but the sky is colorless in comparison. I really am going to enjoy these sunny flowers this week! I helped out on the cash register at Rae’s Yarn Boutique before Christmas (because folks can’t always do their regular shifts on holiday weeks). This meant I was in the building from 10am to 5:45pm on Monday. Most of the time we were hopping-busy; I think I didn’t have quiet for over 3 hours once I opened the doors. However, if one makes good use of short bursts of quiet time in a yarn shop, one can do some spinning in the late after noon when things calm down a little. I was a little whirlwind and spun like crazy when I could sit down at all. I bought the soft wool roving for this 8oz batch of yarn on one Sunday, and finished up plying the yarn on the following week’s Tuesday. I still need to soak it and set the twist, but otherwise the yarn is done. It is gorgeous. For the spinners out there, I split the wool into two 4oz sections. I spun 4oz of singles on one bobbin and then repeated on the second. I plied from two ends of a center pull ball to try and have two skeins about the same. One has 120 yard s, one has 108. I figured if I wanted socks, legwarmers or wristwarmers I’d be set with two nearly equal balls. I had no plans for the yarn I was making. I was spinning purely for the joy of watching the colors pass through my fingers, and feeling the soft wool flow. Now just 10 days later I have some very wonderful yarn begging me to knit with it. So I did a little selfish time at the wheel this week, in the midst of too much to do already. I’ll need to wait to do the knitting until January. But then the question remains, what do I knit? The yarn would love to become a Bloom Shawl (designed by my friend, Trish Bloom). Unfortunately, I just do not have enough yarn to make one. The next choice was to check yardage requirements for a my own Perfect Hug design. The smallest size, which looks best on me, is a capelet which requires 320 yards. I have about 328 yards. Close, but I can make it work. Score! So sometime in 2009, I think I’ll have a mostly-turquoise handspun Perfect Hug Capelet. I’m pretty sure I’ll get a lot of wear out of it. I don’t have a turquoise shawl right now (since I accidentally cut my turquoise mohair Bloom shawl with scissors). A woman whose trademark color is turquoise (me ) can always use a turquoise shawl, I’d say! The cool thing is that the Perfect Hug Shawls take very little time to knit. That will be very satisfying. Now, back to the 2008 to-do list. Photos: The new handspun, and the first version I knit of the capelet-sized Perfect Hug shawl (in Debbie Bliss SoHo, a thick-thin that looks handspun). What pure pleasures have crept into your life lately, even when there wasn’t much time? Brian and I (The Fabulous Heftones) are singing tonight at Altu’s Ethiopian Cuisine (East Lansing, MI). Showtime is 6:30 to 8:30, dinnertime. We sent a notice out about a week ago to our email list. However, some of you are in town and not on the Heftone music list. Who knows, maybe you need a rest from cooking and/or eating leftovers? We would love to see some friends there! My gratitude right now is overflowing. People around me are receiving good news, the sun shone on Christmas for hours and hours and it didn’t snow, my health is leaps and bounds better than it was a year ago, my business is clicking right along, my loved ones are happy, and I had a quiet day with Brian in our home for Christmas. All is well in LynnH-land. Christmas morning I slept in (after a far-too-late bedtime). We had a lovely breakfast, took a nice walk, enjoyed some hot chocolate with real whipped cream to warm up, hung out, ate citrus from Florida (thanks, Mom and Fred), I knit and Brian played ukulele, then later Brian made a stir fry for dinner. After dinner it was my turn in the kitchen. I made a favorite December dessert. I decided in my state of gratitude, that I should share the recipe with you! I love cranberries. The season does not last long enough for me, and though one can freeze the berries right in the bag they are sold in, my freezer is too small for as many as I might like. I need to just enjoy them when I can buy them fresh. I found a cranberry recipe in Jane Brody’s Good Food Book long ago, which is my favorite of all the 350 recipes in that very good cookbook. Of course, I have enough allergies that I have to change/drop ingredients right away. I’ve made this in many different variations over the years and finally realized that she was specifying tasty cooked fruit with a tiny sprinkling of oats on top. I wanted more oats. She is very health/weight conscious. As for me, I’m in need of more fuel these days for a change. A little more oat topping is not bad for my personal health at this time. I love oats, they are so chewy! So I have now taken a leap and really changed the proportions. The idea of cranberries, apples and oats remains a brainstorm of Ms. Brody, but the spices, specific ingredients and proportions are at this point probably more mine than what she started with. I bow to her for the brilliant pairing of these wonderful winter fruits. If you do not have my ingredients, try any flour you have; white or dark brown sugar; margarine or vegetable oil. Note that this is a no-wheat, no egg/corn/yeast/nut/cinnamon recipe, but depending on the oats/flour you choose, it may not be gluten free. In a large bowl, mix filling ingredients thoroughly. Place in greased glass baking pan, mine is about 12″ x 9″ x 2.5″ (30cm x 22.8cm x 6.5cm) and is barely big enough. Mix topping ingredients (can use same bowl) until the butter/oil has been thoroughly worked into the mixture. Carefully distribute evenly over the fruit topping. Bake for 35-45 minutes, until fruit is boiling and the topping smells toasty and looks slightly browned (oats do not brown as obviously as wheat). Remove from oven, cool 15 minutes. Serve alone or with excellent-quality vanilla ice cream. Make yummy noises. We discuss all things sock-related on the Socknitters email list. Subjects range from how to knit socks in any of a zillion ways, which needles/tools people like, what yarns are good for what, patterns, techniques and more. Today Diane asked for clarification on where to start knitting the heel if one is knitting socks toe up. I have a pattern I wrote for teaching Toe-Up socks (it’s called First-Time Toe-Up So cks, which covers the toe, foot and heel, and allows you to make pretty much any leg you desire). This pattern uses a square of flat knitting to start the toe, which is different than a lot of other toe-up socks. It also uses a typical top-down heel structure, called a heel-flap/turned heel. The difference is that the heel flap sits underneath the heel in my sock, and in a standard top-down Western-style sock the heel flap is on the back of the heel. From a knitter’s perspective, they are knit the same way. You can really see it on this pair of striped socks I finished knitting in October. I knit the pair with one skein of Noro Kureyon Sockyarn and one skein of solid standard sockyarn, I think it was Blauband. Notice at left that you could not knit further without wrinkles in the foot, there is no way to pull them up any more. The sock ends under the heel just about directly beneath the ankle bone (picture the person standing up rather than foot out). This sock is ready to start any standard heel type (flap, short-row or afterthought). You can see if you look at the first photo, that I started the striped heel at this location. Knitting is so forgiving that I do it this way every time for me *and* Brian no matter what heel I make. No matter what gauge, our socks fit just great. For the record, the 2nd photo is Lamb’s Pride Worsted (aran/heavy worsted weight wool/mohair) in color Aztec Turquoise. 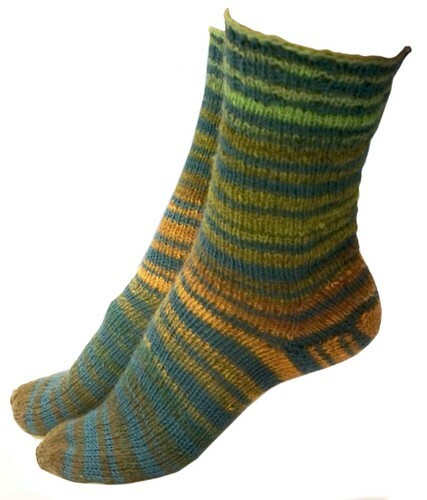 Socks can be knit in any gauge yarn, and these I wore for several winters whenever my feet were especially chilly. The photo was taken in 2005. The socks now have a few patches where I have darned them after heavy use, but they are still warm and cozy. I figured that if Diane had this question, perhaps some of my other readers would be interested. Happy socknitting! If you want to see a variety of socks knit using my toe up structure, you can visit my LynnH SockTour 2006. It’s a slideshow of sorts, showing photos of all the socks I knit in 2006. Many (not all) of them are knit in this way. The 2006 SockTour shows the 124th to 144th pairs I ever knit. I’m up to 164; I guess I’ve slowed down a bit recently! When I was a child, one thing we always seemed to do over the few days off at Christmas, was to put together a jigsaw puzzle. At the time they cost less than a dollar (gasp) and we got a lot of time together for that small amount of change. Annette Petavy, the skillful and artful French crochet designer I’ve mentioned here before, has a new pattern for crocheted bags using sockyarn. This is a very good use of sockyarn and equally a good use of crochet, if you ask me. The yarn is thin which makes a flexible fabric, but the nylon in sockyarn makes it very strong and resistant to wear. Crochet makes a more sturdy and thicker fabric than knitting using the same yarn. It’s great for bags and rugs because of this (with no need to felt to make it less stretchy). Annette’s Christmas blog post is much fun. She has a photo of one of the versions of her bag, made into a web jigsaw puzzle. It took me just over 8 minutes to put the puzzle together. I highly recommend this diversion! Let’s face it, a web puzzle is not the same as my memory of four family members enjoying one another around one card table. However, it can be done without making a mess or taking over part of the house with a table that is out of place. It can also be done in much less time. I enjoyed it thoroughly. The photo here is from last December, but it’s looking worse than this shot right now in Lansing. We’ve had snow on top of snow since last Friday, though Wednesday it melted enough that we got puddles on the roads. It’s a mess here and now it’s freezing again just in time for Christmas travelers to have a rough time. As for us, we’re staying home Thursday and having a no-expectation day. We will find food in the freezer and refrigerator that look tasty and cook those things. I don’t want “tradition” to make me feel obligations that are not really necessary! We’re not big on gift-giving, either. I am really sincere when I say that Brian is my present for any holiday. A day with him is a gift enough. A gift of a sort I never thought I’d be privileged to experience, really. We did go out for sushi Tuesday night and then we sang at Open Mic at Dagwoods together. It was a bit of a holiday date, perhaps. I had holiday gatherings with the knitting guild last Tuesday, then Wednesday was Habibi Dancers and Sunday was a sort of holiday reunion of the Abbott Brothers band, just a jam session and small gifts. My family gathered in early November and I thought I’d see my brother and my sister-in-love on Friday but the weather made it impossible. We’ll see them in January, now. I expect a gathering of my kid knitters probably next week and I’ll see my godchildren this week sometime for a low key get together. I think this time of year is really about reconnecting and celebrating the relationships we have with those we love. This is all good but it really makes for crazy schedules for a few weeks. Thursday, though, Brian and I will just be alone and relax. If the weather is OK for it, we will go for a little walk. Otherwise we will just hang out and be mellow. My real goal is to give myself a cleared desk for the new year, so perhaps I’ll start in on clearing it off. Maybe I’ll even knit. Whatever you do, remember that balance/sanity is a good thing in the midst of too-full calendars. Don’t drive in bad weather if it’s truly not safe. Your loved ones would best be glad to have you safe, even if they miss you at a gathering. Lynne in Oz (Australia) and Lisa in Toronto, Canada have spoken up to be part of the upcoming “Selfish Knitting Month.” This means that it is now *International* Selfish Knitting Month. They are not the only ones who have piped up to say they want to be part of this, but the only who have identified themselves as outside the US (which is where I live). I like how international the internet is, that delights me to have us connected through the ether when we can’t be in one another’s physical presence. There are no rules other than you knit for yourself during the month of January. I would hope you would knit more for yourself than others in January, maybe (ideally) *only* for yourself. The good news is that there are no selfish-knitting Police, so you decide for yourself how it goes. It’s about NOT feeling pressure or stress. It’s about being good to ourselves and being clear that we choose to do so. The photo is a bulky cable scarf one of my “Knitting Study Hall” students knit for herself recently. She had never done cables so wanted to try them. She made this in less than 2 weeks. Nice job, don’t you think? She loves it, and it’s very warm just when we need it. Today I saw one sign say it was 1 degree F. I think it was more like 4F (-15.5C) but who is quibbling? Either number is just plain cooooold! Fabulous Heftones: Crooning Twice this Week! The Fabulous Heftones have been fielding calls this week, and we landed four new shows. Two are within the next 7 days, one is tomorrow! This is on the same block as Rae’s Yarn Boutique, across from Emil’s Italian Restaurant and next door to Gone Wired Cafe (which once was Rupp Campfitters). This delightful, locally-owned shop has unusual, quality reading materials and fair trade gifts from around the world and Michigan.They just recently opened a door in the wall directly into the Gone Wired Cafe’, which has excellent food, teas and coffee. We will sing you sweet tunes while you eat a relaxing dinner you don’t need to make yourself. This is a switch in our schedule (we will no longer be playing there on January 24, but are still scheduled for our annual Valentine’s day event). Altu’s again March 28, same time/place. Perhaps some of you can join us? It should be a lot of fun! January: Selfish Knitting Month Coming Up! Just for the record, I am making an important announcement now, about January. Perhaps every knitter I know is making at least one knitted gift for this time of year. Many of us are deferring gratification and putting off our desires to knit projects for ourselves. Never mind that even when we don’t knit, there is a lot of need to set aside personal preferences in December for the good of the whole. It’s lovely to commune with our loved ones, but it takes a bit of a toll on what free time we didn’t have to start with. In my case, I had a very unproductive 2007 because of health issues (unresolved food allergies). My situation really turned around in a wonderful way, in March of this year. I have been sprinting to the finish line to catch up, ever since. In 2007 I finished writing/issued 3 patterns. This year I am working on finishing my 10th pattern (some need to wait to be announced). Five of this year’s patterns I actually started in 2006 or 2007. I am working full-tilt to finish up old and current projects this week and next, so that I can start 2009 with only projects for 2009. Imagine that! I don’t know about you, but that means to me that I need a reward in January. I am declaring January “Selfish Knitting Month.” Brian asks if it’s International Selfish Knitting Month, but I guess I say it’s Lynn–ternational Selfish Knitting Month at the moment. If some of you out of the US join me, then it can really be international. I hope that happens. So prepare in your mind… what will you make after the ball drops in Times Square? What will you cast on? What will you make just because you dream of making it, when it’s finally your turn??? First, I’ll need an instant-gratification project. I’m really thinking about knitting a second pair of Fuzzy Feet. I made a pair in 2002, when the pattern first came out (on Knitty) and loved them, and wore them a LONG time before they finally gave out. I have a few sweaters in my mind. I need to replace my favorite turquoise mohair sweater, which has worn thin on the elbows. I bought new similar yarn at Threadbear last year and swatched for it, but never got past a swatch. This one is most important and I think since it’s very simple and blocky I can realistically make it in a month or two if I allow myself to do that selfish thing for a little while. I also have some Debbie Bliss yarn, it’s a magenta/fuschia tweed in a bulky weight, which I got at Rae’s Yarn Boutique. It wants to keep me warm when February winds blow. I got the pattern book for the sample sweater I tried on at Rae’s, it looks good on me. I may do that design, maybe another. And my big dream is to knit a Kristin Nicholas pattern. I am *IN LOVE* with her Circles, Bobbles and Stripes Sweater pattern from the Kristin Knits book. It requires five colors of yarn, knitting in stripes and intarsia, and a little embroidery. I am in love. I’ll have to order the yarn to do it as I dream it in my mind. Kristin designed it in her lovely Nashua Julia wool/alpaca/mohair yarn, but her color palette is a little more subtle than mine. It takes five colors, Kristin never shies away from more! Rae says she can order me some Brown Sheep Naturespun Worsted in colors that I adore, so I am leaning toward that. I can not find a photo of the sweater on Kristin’s site, but Ravelry has a Project Page showing five different projects made by members of Ravelry based on the pattern (it does not show Kristin’s original, which is photographed on the back cover of the book and which I saw in person at TNNA last June). If I do that project, it may take me a full year, as my last long-sleeved sweater did. However, I would love the finished product as long as the yarn held out, I’m sure of that. I’m excited about this prospect. January 2009 is helping me get through a to-do list with 21 things on it, some of which may take a dozen or more hours. I may defer some personal items to January, but I am determined that my business will be caught up on January 1. Some knitters never knit for themselves. Would this be your first time allowing selfish knitting? Will you join me? Do you know already what you want to start in January, just for yourself? brought to you by: ColorJoy by LynnH. Construction: Tip down on 4 double-pointed needles (3 holding, 1 working); begun with stockinette rectangle. Afterthought thumb. There are many photos to walk you through new techniques here. It is possible to breeze through a pair, especially for knitters who have used DPN’s before. With thicker yarn, these are much faster than socks! These are fun, fast, and take very little yarn. The one mitten in photo at left was made with less than one 50gm ball of Aran-weight Nashua Vignette, a wooly washable/dryable yarn with a tube structure (tiny I-cord). So you need 100gm or less for a pair of Aran-weight ladies’ mittens. The photo at right is Noro Silk Garden, worsted weight wool/silk blend in a singles (one ply) structure. Hand wash. Luxury and warmth in the same gift! You can get the pattern now in my online shop. I usually mail out paper copies with a $1 shipping fee. However, if you make a note to me in your check out process (there is a box for notes) that you want a PDF, I will email you an attachment within 24 hours and refund your shipping charge. My cart is inflexible and does not allow me to remove the shipping when you check out, but I’ll be right on it. The pattern allows for knit to fit, so they will fit a child to an adult male. There are notes for standard mitten sizes if you can not get a measurement from the intended recipient. I hope that some of you are as excited about this pattern as I am. No “Join without twisting” in this design! I have had an unbelievable number of classes lately. Sometimes I have enough people that I’m explaining/helping every second and don’t remember to take photographs, but here are two. Chelle gets one of my promised LynnH-Created prizes. This is a Party Stole which is almost identical to the one I wear myself. Chelle likes textured knits and wears green, I hope this green is a flattering one! Deb gets some lovely light-worsted kettle-dyed Araucania wool in raspberry shades and my Toe-Up Mitten pattern, which somehow I have not mentioned here and is not even on my shopping cart yet. This is a good wooly-type wool which I think Deborah will appreciate. She walks dogs every day, so surely mittens are a good choice. Debbie wins the second of my promised LynnH-created gifts. It is a full pound of Henry’s Attic Licorice Twist merino, hand-dyed by me. I tried one skein of this yarn when looking for yarns to dye professionally. It’s just lovely but did not work for the niche I was wanting to fill. There are 1120 yards in this pound, which makes it a light worsted rather than a true worsted (it has 246 yards to 100 grams, rather than a standard 220 yards for worsted weight). Debbie, this is a lot of yarn and should bring you a fun project of some sort. Maybe a knit tee shirt (I love the one I knit with yarn this weight)? Maybe a shrug? Lightweight legwamers? Nicole gets two balls of the very squishy and lovely machine-washable Ornaghi Merino Kind yarn. It should make really comfy socks. I am not sure if you already have my First-Time Toe-Up sock pattern? If you do, will you tell me which other pattern you would like me to send? She has done a lot of knitting/testing for me over several years, a precious gift. I’m pretty sure she doesn’t have my Topper-Down hat pattern yet, and I know she likes turquoise and purple. She gets Tahki Shannon yarn in mottled/marled turquoises with red flecks for the main hat. Her stripe yarn is Nashua Creative Focus Worsted, in a plummy deep purple that does not show well in photos. Riin gets a skein of the lovely wooly light-worsted kettle-dyed Araucania in warm greens. I know she likes this color and she does a lot of walking in winter. This has potential to keep her warm with nice densely-knit fabric on her hands, using the Toe-Up Mitten pattern. Trish is the one who designed my favorite shawl pattern ever, the Bloom Shawl (I have knit several and this winter I’ve been wearing one over my gray winter coat every day). She loves color as I do. Today she gets rainbow-colored New Zeeland worsted-weight wool (the labels are missing but I think it is half a pound) and a Toe-Up Mitten pattern. Thank you to everyone who commented during my Blogiversary/Birthday wee. Thanks, actually, to every commenter any time, any day! I appreciate every one of you out there.